You wait for three months for a new Basho Film and then two come along at once! Angkor Wat (or Angkor Vat) (Khmer: ????????? ), is a temple complex at Angkor, Cambodia, built for the king Suryavarman II in the early 12th century as his state temple and capital city. As the best-preserved temple at the site, it is the only one to have remained a significant religious centre since its foundation—first Hindu, dedicated to Vishnu, then Buddhist. The temple is the epitome of the high classical style of Khmer architecture. It has become a symbol of Cambodia, appearing on its national flag, and it is the country’s prime attraction for visitors. After spending 3 days over Xmas 2008 in Siem Reap, and recording over 2 hours of footage of our exploration of these amazing structures, I couldn’t help but make a short film to celebrate them. However, Understanding Angkor is not easy, so I enlisted the help from the MP3 library of philosopher Alan Watts. There is a lot more to say about Angkor, it is by far the best temple complex I have ever visited, but this will await the blog entry on the area, which is 50% complete. Hope you enjoy, and please leave a comment. 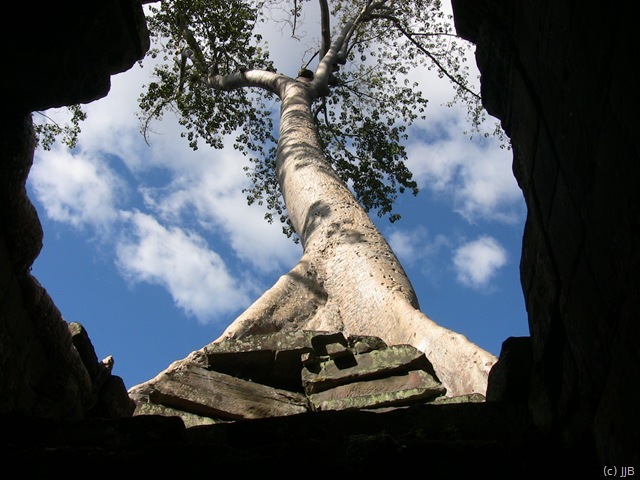 Temples of Angkor from Basho Matsuo on Vimeo.